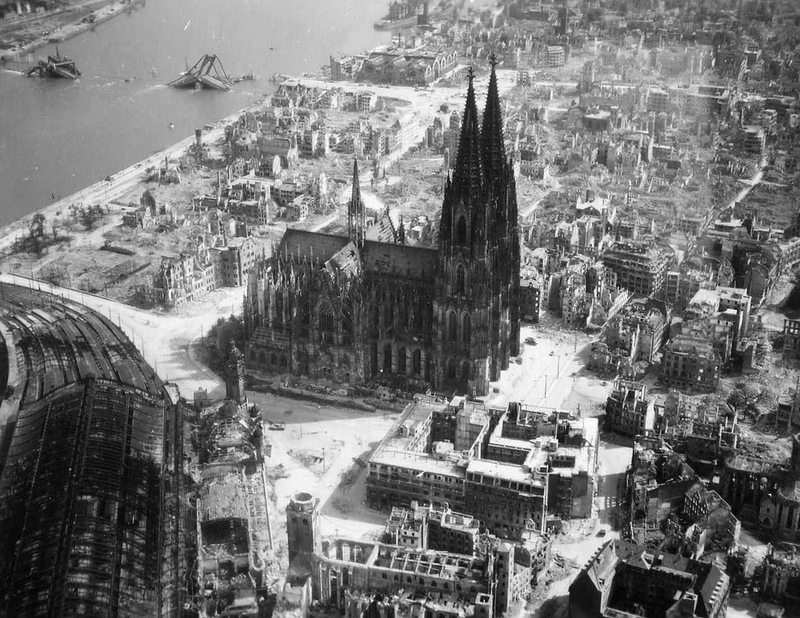 Aerial view of Cologne, 1945-46. Point of focus is the historical cathedral. Picture from the public domain and not dad’s. 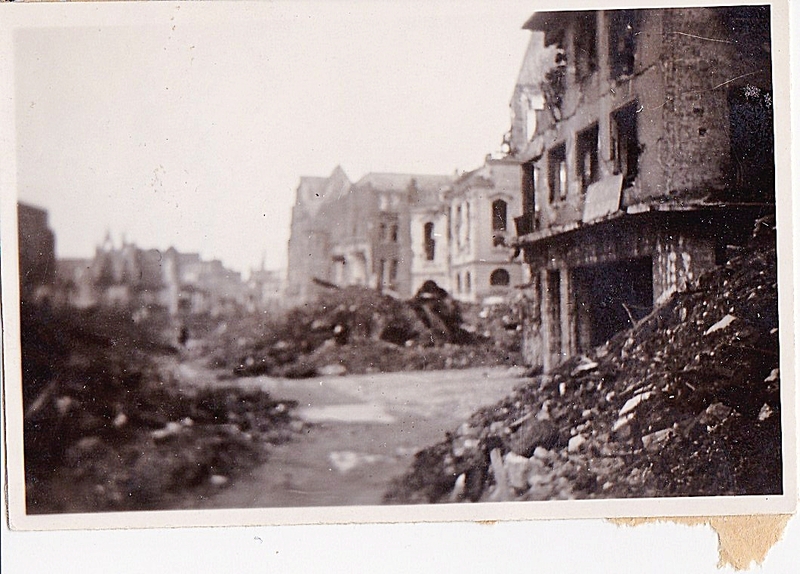 Among the pictures my dad sent home to his father from Cologne, Germany in 1946 are significant number of pictures of bombed out Cologne. 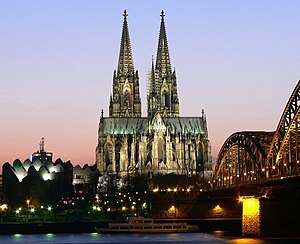 Wiki notes this: Cologne was one of the most heavily bombed cities in Germany during World War II. The bombing reduced the population by 95% and destroyed almost the entire city. Here is a sampling of the pictures dad sent home. Most of them are centered around the cathedral. Cathedral prewar. 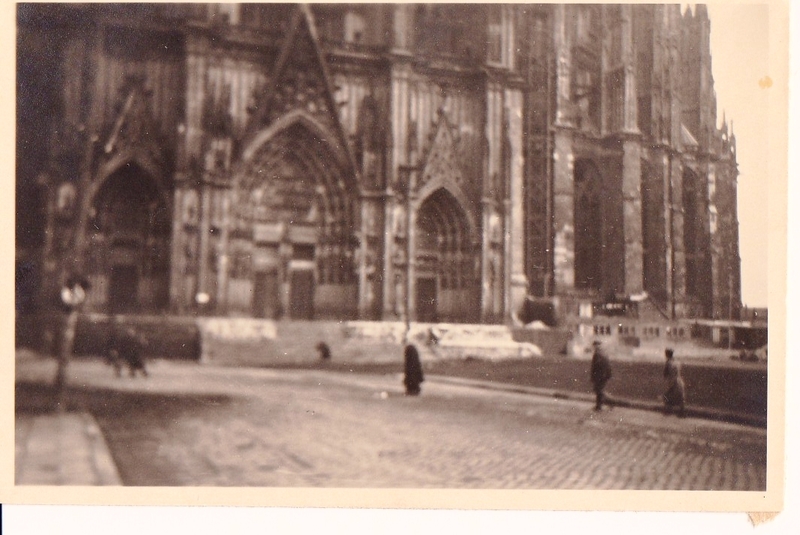 Dad must have purchased a prewar photo book of the cathedral that he sent home with his own pictures. 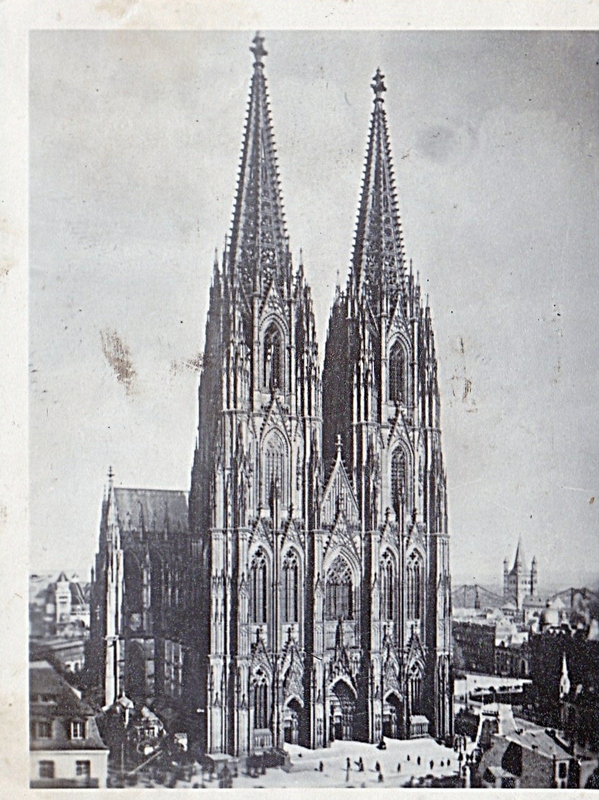 On the back of this picture it reads: Cologne cathedral as of now. Writing on the back simply says “north view.” The people in the picture give some indication of just how big the cathedral was (is). A landmark that large would have helped bomber crews target the city. Writing on the back of this one reads, “busy section of Cologne proper.” Dating would be winter\spring, 1946. Barely enough room through the rubble for a jeep or truck to get through. 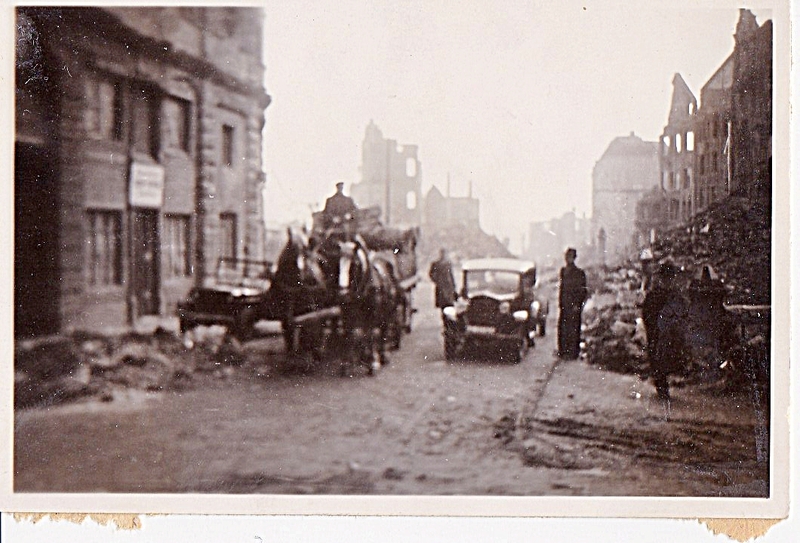 Dad said many of the Germans were employed removing the rubble, mostly by hand. Another picture captioned, “Cologne proper.” MP Jeep on the far left. In the distance you can see the skeletal remains of a building. Dad spoke frequently of the devastation. The aerial photo above clearly shows the same bridge destroyed. The bridge would have been a bombing target. 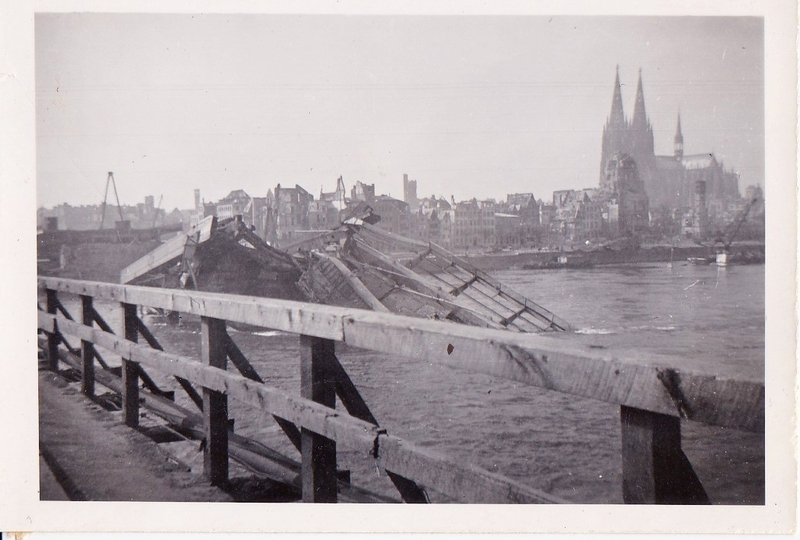 The caption reads, “Cologne Bridge.” I am uncertain if it’s the same destroyed bridge. The statue is possibly Wilhelm I. Friedrich Ludwig – Statue an der Hohenzollernbrücke Köln. During World War II, Cologne was a Military Area Command Headquarters (Militärbereichshauptkommandoquartier) for the Military District (Wehrkreis) VI of Münster. Diersburg, who was responsible for military operations in Bonn, Siegburg, Aachen, Jülich, Düren, and Monschau. Cologne was home to the 211th Infantry Regiment and the 26th Artillery Regiment. tons of explosives, approximately two-thirds of which were incendiary. population had already recovered to approximately 500,000. By the end of the war, essentially all of Cologne’s pre-war Jewish population of 11,000 had been deported or killed by the Nazis. The six synagogues of the city were destroyed. The synagogue on Roonstraße was rebuilt in 1959. Cologne Cathedral and bridge today. That had to be a catastrophic thing for people to endure. Thanks J.G. I changed my caption on the statue to reflect your research. That’s some good digging on your part! the first bridge is Hindenburgbruecke, it collapsed without any bombings February 1945; probably because of wrong done maintenance works. The second bridge is indeed Hohenzollernbruecke. 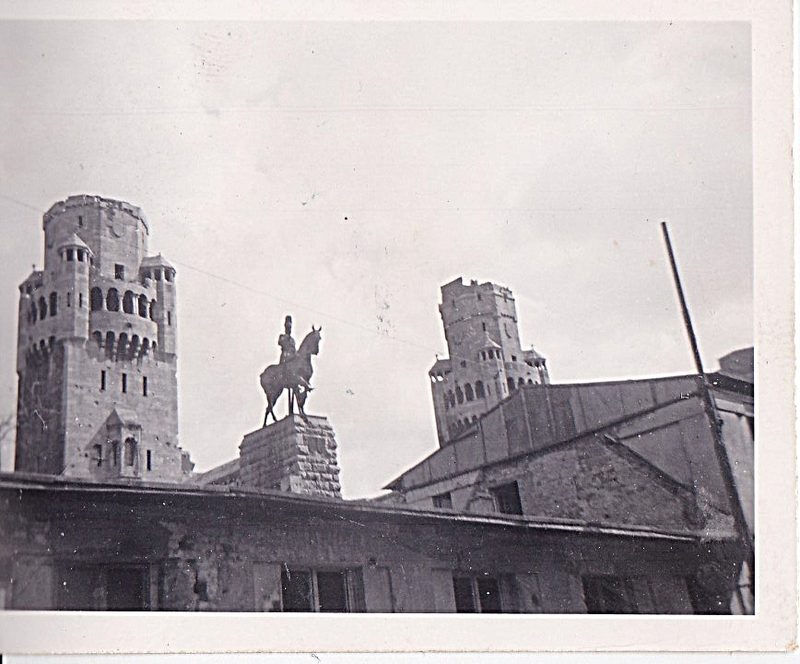 The towers were removed after the war. Danke Dierk for the information and link to your website. Cologne is a beautiful city and I think my father wanted to capture something of what it looked like prior to the bombing. 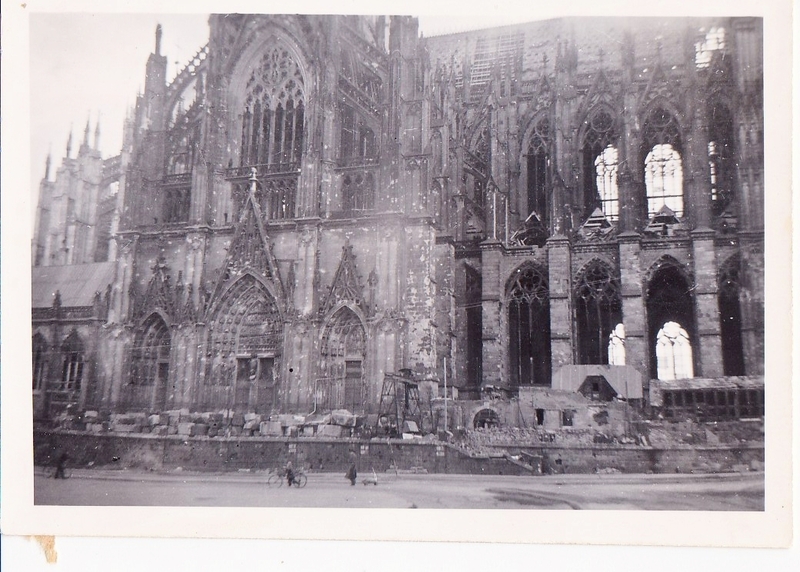 I really would like to show the above photo cologne-cathedral-1.jpg on my website about Cologne at the end of the war since it shows the destructions at the cathedral very good and this would be a great addition for the page. Of course I will give you credit there. Is this ok for you ? Thanks for stopping by Dierk and yes you can use my dad’s pictures of the Cologne Cathedral on your website. His name was Pvt. Harry Roeder, 504th Military Police Battalion. Was he a MP? I have picture of my dad’s MP platoon and on the back are most of the names. I list them in one of the posts in this series.